One of the early locations of the Long Beach Auto Club branch at 757 Pacific Ave. The Long Beach branch of the Automobile Club of Southern California will celebrate its 100th birthday during the week of July 21, 2014 with member appreciation days and special events. Scheduled centennial events include a free CarFit customized vehicle and driver screening for mature drivers from 9 a.m. to 3 p.m. July 25 in the branch parking lot, and a free travel show exploring Viking River Cruises in Europe on July 22. Reservations for both events are required – call (714) 885-2312 for CarFit and (562) 377-3770 for the travel show. The Long Beach branch at 4800 Airport Plaza Drive is one of the largest Auto Club branches in Southern California, serving more than 150,000 members in the area. It offers free DMV vehicle-related services, a full-service travel agency, maps and travel publications, insurance services, teen driving school, discount attraction and movie tickets, and many other member benefits. In addition to employing 70 staff members in the branch, the Long Beach location also houses a roadside service call center and other member support services, bringing the total number of Auto Club employees in Long Beach to more than 500. The Auto Club was founded in December 1900 by 10 horseless carriage enthusiasts and established its headquarters in Los Angeles. It opened its first outlying branch in San Diego in 1913, and the Long Beach and Pasadena branches both opened in July 1914. The original Long Beach branch was housed in the now-demolished Virginia Hotel. Photo courtesy of the U.S. Library of Congress. The first two Long Beach office locations were in hotel lobbies while the organization prepared to open its own facility to handle the population explosion in Long Beach (the city population grew by more than 200 percent from 1910 to 1920). 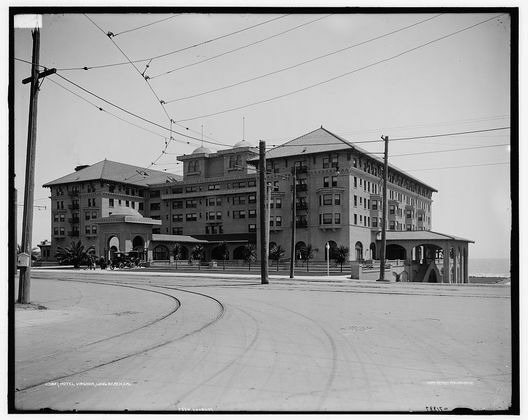 In July 1914, the Auto Club moved into the lobby of the Victoria Hotel, once located at Ocean Boulevard and Chestnut Avenue, and less than a year later moved again into the De Luxe Hotel, also on Ocean Boulevard. The first dedicated Long Beach office opened in March 1916 at 249 American Ave. (now Long Beach Boulevard). 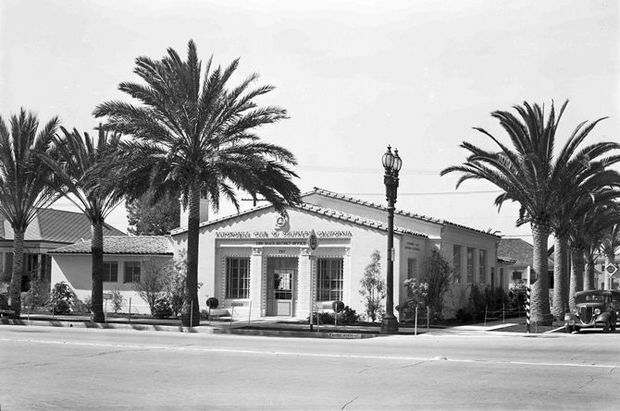 As city growth continued, the Auto Club branch grew too, moving to 1157 American Ave. in 1924, 757 Pacific Ave. in 1939 and 4800 Los Coyotes Diagonal in 1963. The Auto Club has operated at Airport Plaza Drive since 1993. In addition to providing member services in Long Beach, the Auto Club also assisted with the city’s first major car show held in 1920 by the Long Beach Automobile Trade Association, according to the Auto Club’s Touring Topics magazine (now Westways). The Auto Club posted Southern California’s first road signs starting in 1906, including many street signs in Long Beach. It initiated emergency road service in 1925 and started the region’s first highway patrol service in 1924 (unlike today’s CHP, this was solely dedicated to helping stranded motorists and even delivered milk and medical supplies). The Automobile Club of Southern California initiated and completed the signposting of the National Old Trails route from Kansas City to Los Angeles, used by thousands of tourists and immigrants to California. The Southern California club also was one of the first promoters and route engineers for building the International Pacific Highway from Fairbanks, Alaska to Mexico City. For more information on Auto Club membership and services, visit the Long Beach branch or AAA.com. The branch phone number is (562) 496-4130. Branch hours are Monday through Friday, 9 a.m. to 5 p.m., and Saturdays from 10 a.m. to 2 p.m.